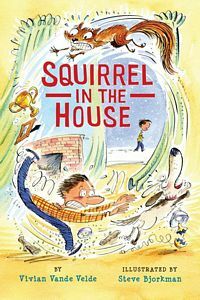 "Judy Bradbury Writes about Books that Open Minds and Hearts, Initiate Conversations, and Expand Possibilities." Sign up for Children's Book Corner to read about more books for children. For more pictures from the Webster B&N event, click here. For more pictures of the Pittsford B&N event, click here. To see more pictures of the signing at the Greece Barnes & Noble, click here. For pictures from older events, click on the "Photo Albums" flag. 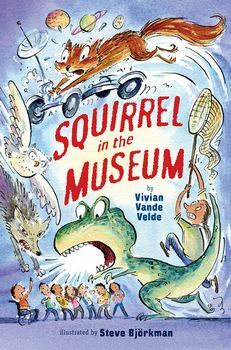 Squirrel in the Museum (pictures by the talented Steve Bjorkman), published by Holiday House. 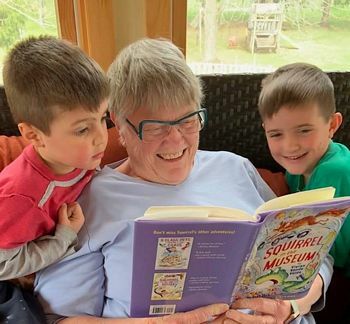 And--just because it's so cute--here's a picture of my friend (and fellow author) MJ Auch reading Squirrel in the Museum to her two grandsons. No, I haven't joined the 21st century. 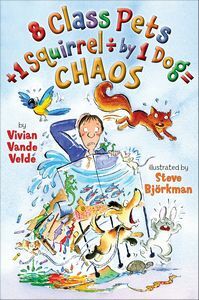 Vivian Vande Velde Books Facebook fan page! Notice the Study Guides flag.